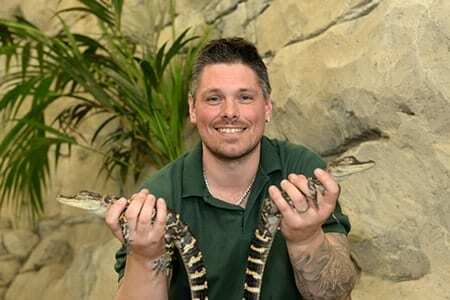 Shaun became known as ‘The Croc Man’ following a one-off documentary shown on the Discovery Channel and later that year a mini-series was made by channel 5, following his journey to open Crocodiles of the World. Prior to opening the zoo Shaun studied and learnt about crocodiles through his own personal collection; all housed in a purpose-built enclosure at the semi-detached West Oxfordshire home he shared with his young family. By 2009 his collection had reached 21, which was when he knew he had to re-locate them! Setting up the zoo has taken personal sacrifice, including leaving the family building business and selling his family home. Since moving to the new premises in 2014 the zoo has celebrated the arrival of many new arrivals including saltwater crocodiles and the successful breeding of critically endangered Siamese crocodiles. 2015 saw the new addition of an education zone, with a lively outdoor space that is home to meerkats, otters, tamarins, owls and some jovial kookaburras! And it going to be another exciting year; with a significant extension to the ‘croc house’ that will house some exciting new arrivals, not to mention the growing congregation of Nile crocs!